Well whaddya know. Not only is David Beckham a world famous soccer player and adored by women who never watch "the beautiful game," he is a walking Christian art gallery. Beckham apparently has other Christian tattoos including a cross and an angel. The latest is of a dejected looking Christ, kneeling and leaning forward. It is based on a painting called "Man of Sorrows" which is a phrase from the book of the prophet Isaiah. These images are a big commitment, really. Anyone can wear a cross as a piece of jewelry, then take it off. A tattoo is as close to permanent as you can get. Next time you see Becks, ask him to take off his shirt. There is a Christian tattoo association which features every faith tattoo imaginable. My personal foray into the world of tattoos is limited. I have a celtic cross on my forearm (hey, this way I can't lose it.) I also have a small scallop shell on my chest, as does our son, Isaac. It is a Christian symbol for pilgrimage and we got them together as he was setting out to wander the world. 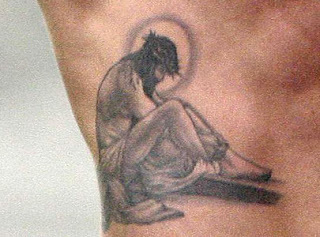 Do you find it strange that Beckham sports tattoos of a religious nature? What about tattoos in general -- a form of artistic expression or self-mutilation? I knew David was automatically the coolest pastor ever when I first saw that Celtic cross. That is just so badass, man. That said, I remember an encounter I had with a woman on a dragon boating team I was on whose position on tatoos was that they were humankind tainting itself through voluntarily taking on 'the mark of the beast.' She was a kindergarten teacher too! Talk about a conversation stopper on a sunny Saturday afternoon! In the end, I don't have a problem with tatoos of a religious nature. I also know that my own innate wussiness wouldn't place me anywhere near a tatoo parlour, so my hat goes off to Becks, David, Issac and the rest for both the strength of their convictions, and for having the guts to get 'inked' with 'em. I am going to accept badass as a complement!